Probably the most iconic piano song of all time. Billy Joel’s classic “Piano Man” uses hints of Jazz, Blues and Pop-Piano and is an embodiment of Piano Couture’s chordal approach to playing piano. In a time that’s both super-exciting and utterly rough (more in-depth personal story in the newsletter and to follow soon on this blog), I’ve managed to squeeze out this awesome lesson – which eventually took me over two weeks to create (not because of the difficulty of the tune, but due to said troubles). Billy Joel is one of the grand-fathers, the founders of Pop-Piano as we know it. Except he set a way better example than is being followed through nowadays 🙂 . His “Piano Man” is one of those paramount examples of how he controls the full skill set of Pop-Piano. Listen, watch and soak up to learn from the best. This one really is golden – and quite the friend impresser – for just about everything ranging from chord knowledge, voicing, arranging to technical skills and more. That’s why I decided to devote a dedicated live stream lesson this lesson this Sunday (May 21, 2017) for all Premium Couturians, where we’ll dive even deeper and take an up close and personal look into all kinds of different aspects as to why this tune is just so good (and in C! how convenient for learning 😀 ). But first and foremost, have fun with this weeks video tutorial of “Piano Man”! That nice little killer filler on D and G – you know which I mean, don’t you? 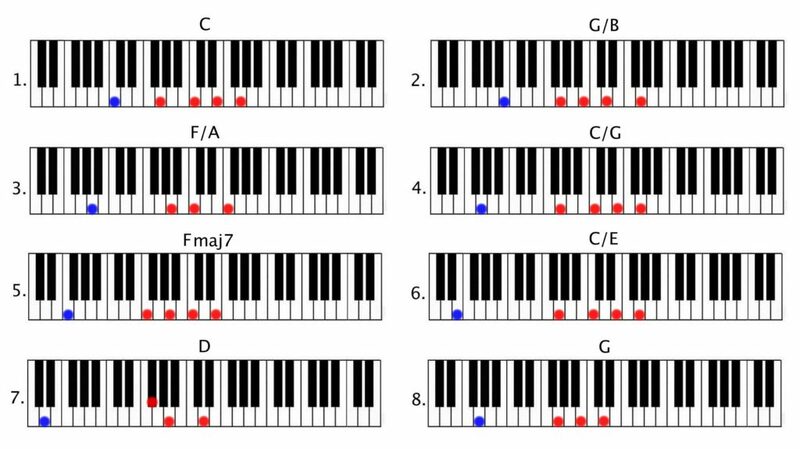 Main chord progression image below the video. Full Chord Sheet with chord progression as per used in the tutorial & solo (round 1) transcribed, audio only and MIDI file available for Premium Couturians. In the comments below, please let me know what you think and / or are looking to learn! get all that and the video download included with our “Oldschool Pop” tutorial pack.